The Tokyo watch scene is unlike any other you may have experienced. I first became enamored with the watch scene in Tokyo after stumbling onto a Smiths 6B, one that I had only ever seen in a book, in a store in Shinjuku that also sold candy. It was one of the weirdest shopping experiences I have had. The watch when I examined it in the store was gaining 15 seconds every minute but I bought it because after years of collecting I had never seen one come up for sale. It was pretty beat up but looked all original. As you would expect Tokyo has the standard jewelry stores and brand boutiques. What makes the scene here more interesting are the stores that specialize in second hand watches and vintage watches. Specifically the vintage watch stores are the ones that capture my imagination. The stores profiled in the following series are a group of watch stores that have been on my radar for almost 15 years. I have visited Tokyo 4 or 5 times but 2017 was the first time I was able to carve out time to visit these stores. 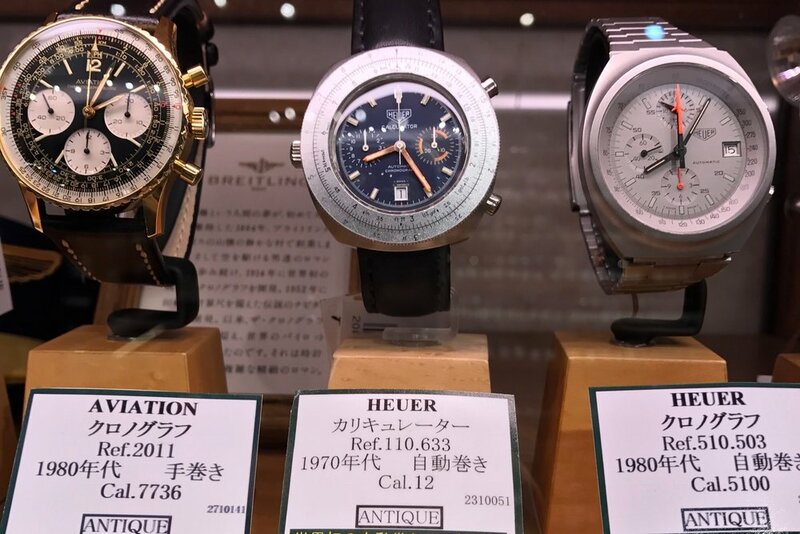 You can literally find second hand and vintage watches all over Tokyo, in some of the most unlikely places but the ones we were interested in were spread across a city that boasts 25% of the country’s population. So of all the stores I have had on a short list we were able to visit all but one. Even then there were 4 or 5 more I would like to have seen. However, I believe we were able to visit all of the most important stores specializing in vintage watches in the Tokyo area. The vintage watch shopping experience in Tokyo is one that we can only wish for in the US or even in Europe. It’s casual, professional, and the selection is mind-blowing. There are great places to shop in the US like [analogshift’s coterie] of online stores, the watch forums, eBay, but outside of the online universe usually you have to make an appointment to see the watches in person or the in-store experience is less than confidence inspiring. If you have a limited amount of time in Tokyo or your family has a limited amount of patience for your interests Jack Road should be your first stop. In addition to Jack Road, the mall where it is located hosts at least half-a-dozen additional vintage and second hand watch stores. Without a doubt Jack Road is the biggest and the best of the bunch as far as selection is concerned. Occupying three store fronts within the mall, Jack Road had the largest and most diverse selection of any of the stores we visited on this trip. There is Jack Road which sells men’s watches. Betty Road, located across the hall, that deals in women’s watches. Adjacent to both stores is one well appointed room where you can inspect your potential purchase. The selection at the time that I visited ran the gamut of vintage and second hand to modern new watches in almost every price point. The vintage selection was what I was there to see and the selection did not disappoint. I was able to view, in one shelf alone 3 generations’ worth of Rolex Explorers and Explorer IIs [the picture I wanted to use is blurry I think]. The 4th generation (a 1016) was located in a separate case. I had seen most of those watches in one form or another but never together in one place. The selection of Submariner’s is equally inspiring. Other notable watches included a selection of Heur’s, a Smith’s military, and series of limited edition Panerai watches. The second hand watches ran a range that included entry level Seikos to Moser and a collection of ultra-complicated Patek Philippes. I had read about Moser but never seen one until that day and that day I saw 12 on offer. They also carry a selection of new watches. I almost bought the newly released SBDC051 but they didn’t have the dial color in stock that I was looking for. The staff on that day also included a woman that speaks English and Chinese, as well as Japanese speaking staff. Jack Road sells on the Internet as well as an Instagram presence.